The ten members of the Judicial Performance Commission of the Twentieth Judicial District unanimously recommend that Judge Andrew Ross Macdonald BE RETAINED. Judge Macdonald completed his undergraduate studies in 1982 at the University of Colorado. He graduated from Stetson University Law School in St. Petersburg, Florida, in 1985. 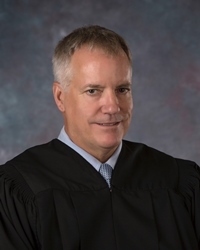 Before being appointed as a District Court Judge in May 2011, Judge Macdonald spent one year in private practice in St. Petersburg, three years with the Public Defender’s Office in Clearwater, FL, and the next 21 years in the Boulder County Attorney’s Office. In the latter position, Judge Macdonald handled a variety of legal matters for the Sheriff, Coroner, District Attorney, and the Board of County Commissioners. When asked if Judge Macdonald seemed to favor the prosecution or the defense in criminal matters, attorneys reported a slight bias in favor of the prosecution, rating him about average in his level of perceived bias among the nine judges up for retention. Note for context that attorney respondents tend to report, on average, a slight bias in favor of the prosecution among all judges standing for retention all across the state. In written comments, several attorneys complimented Judge Macdonald on his pleasant and fair demeanor. Several recognized that he is still learning many aspects of criminal law, which we would expect for a judge who is relatively new to the bench. Overall, Judge Macdonald appears to be successfully growing into his role as a District Court Judge, aided in large part by his engaging judicial demeanor and enthusiasm for the job.